Sequence Up/Down. This switch determines if the sequence is running up- or downwards. OSC send messages On/Off. When you are sequencing through the local presets, OSC-messages will be send back to the computer when this switch is On. For debugging or visual feedback, this function is very useful. At high speeds this function will influence the performance. Start/ Stop sequence. Start or Stop the sequence. When this button is switched On, the DifAs will run through the presets stored in local memory. Manual mode. If switched on, the DifAs is in manual mode. In this (prototype model) the up/down push buttons are not included. Control Voltage to speed. This potentiometer generates 0-5V for analog input A0 which converts the incoming voltage into sequence speed. Depending on the status of switch  this potentiometer or an external voltage can be the source. Int./Ext. The DifAs can sequence through presets based upon external or internal signals. When the switch is set to internal, the speed of the sequence is linked to the number (timer)received in the OSC-message. If the switch is set to external, the triggers of the sequence are determined by the flanks of the external input . CV/OSC. The speed of the sequence can be determined by a control voltage or by OSC (/cf message), which is stored in local memory. CV speed Int./Ext. If this switch is set to external, the CV input of the DIfAs will be connected to an external control-voltage. When set to internal, the potentiometer described at  will be the voltage source. CV-preset input. If you apply this control voltage and you select this option (v85), the value will determine the next preset if the DifAs is in sequence mode. Switch  will activate or de-activate this mode. CV-sequence speed input. This cv input can be used to change the speed go the sequence linked to the value of the control voltage. If the value of the cv is high, the speed is at its maximum (around 1,7kHz). Low values result in slower speeds. External Sync input. This input can be used to connect an external (sync) signal. When switch  is set to external, the DifAs will step to the next preset in sequence on the changing flank. See also switch . X0-X7, Input. 8 x audio input on banana connector and small pin header. It is connected in parallel and connected in exact the same order as the banana connectors. The maximum amplitude the DifAs can switch is between -12V and +12V. GND. Both banana and pin-header can be used for the ground connection. When you are working with different devices, it’s important to make good ground connections. Y0-Y7, Output. These 8 banana-connectors are physical outputs of the DifAs. Also the small pin-header connections can be used for output. It is connected in parallel and they are connected in exact the same order as the banana connectors. +5V. To provide external electronics with +5V, this small pin connection can be used. Also connect the ground! CV-preset On/Off. This switch determines if the cv-preset mode is active or not. See also description . Positive/Negative. If the DifAs is triggered by an external signal , this switch determines if only the positive-flank of the signal (OnSet) is used to step to the next sequence, or both the negative- and positive flank. Reset. This is the reset button. It will reset the onboard microcontroller. Ethernet In/Out. Direct ethernet connection (cat5) to the computer or network. The communication is realized with OpenSoundControl. Power connection. This is the power-connector. The DifAs needs +15V, -15V and +5V. Please use het appropriate power supply. Start or Stop the sequence. When this button is switched On, the DifAs will run through the presets stored in local memory. Sequence Up/Down. This function determines if the sequence is running up- or downwards. Int/Ext. The DifAs can sequence through presets based upon external or internal signals. When the switch is set to internal, the speed of the sequence is linked to the number received in the OSC message. If the switch is set to external, the speed, or triggers of the sequence, is determined by the flanks of the external input . Manual mode. If switched on, the user can step through the presets manually with switch [8, up] and switch [10, down]. Up. If manual mode is selected, pushing this button will step to the next preset. Reset. Underneath the board (out of sight) a small push button is hidden. This is the reset button. It will reset the onboard microcontroller. Down. If manual mode is selected, pushing this button will activate the previous preset. External Sync. This input can be used to connect an external (sync) signal. When switch  is set to external, the DifAs will step to the next preset in sequence on the changing flank. See also switch . Led indication. These 5 leds indicate which preset is active when the DifAs is in manual mode . The indication is binary, varying from 00000-11111 (=32 presets). CV-preset input. If you apply this control voltage and you select this option (v85), the value will determine the next preset in line if the DifAs is in sequence mode. Model 1 does not have a physical switch to activate this mode. Y0-Y15, Output. These 16 banana-connectors are physical outputs of the DifAs. Also the small pin-header connections can be used for output. It is connected in parallel and they are connected in exact the same order as the banana connectors. From left to right Y0-Y7 upper row and Y8-Y15 on the lower row. +5V. 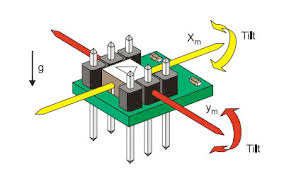 To provide external electronics with +5V, this small pin connection can be used. +12V. To provide external electronics with +12V, this small pin connector can be used. Start/ Stop sequence. Start or Stop sequence through local memory. When this button is switched On, the DifAs will run through the presets stored in local memory. OSC send messages On/Off. When sequencing through the local presets OSC-messages will be send to the computer when this switch is On. At high speeds this function will influence the performance. CV/OSC. The speed of the sequence can be determined by a control voltage or by a OSC received number, which is stored in local memory. Int/Ext. The DifAs can sequence through presets based upon external or internal signals. When the switch is set to internal, the speed of the sequence is based upon the number received in the OSC message. If the switch is set to external, the speed of the sequence is determined by the flanks of the external input (13). Positive/Negative. If the DifAs is triggered by an external signal (11), this switch determines if only the positive-flank of the signal (OnSet) is used to step to the next sequence, or both the negative- and positive flank. Manual mode. If switched on, the user can step through the presets manually with switch (8, up) and switch (10, down). Down. If manual mode is selected, pushing this button will step to the previous preset. External Sync. This input can be used to connect an external (sync) signal. When switch (5) is set to external, the DifAs will step to the next preset in sequence on the changing flank. See also switch (6). Led indication. These 5 leds indicate which preset is active when the DifAs is in manual mode (7). The indication is binary, varying from 00000-11111 (32 presets). Y0-Y15, Output. These 16 banana-connectors are physical outputs of the DifAs. Also the small pin header can be used for output. It is connected in parallel and the connected in exact the same order as the banana connectors. From left to right Y0-Y7 upper row and Y8-Y15 on the lower row. Ethernet In/Out. Direct ethernet connection (cat5) to the computer or network. Communication is realized with OpenSoundControl. X0-X15, Input. 16 x audio input on banana connector and small pin header. It is connected in parallel and connected in exact the same order as the banana connectors. From left to right X0-X7 upper row and X8-X15 on the lower row. The maximum amplitude for the DifAs to switch is between -12V and +12V. Model 4, with banana connections and pin-headers. No switches. Ext. Trigger input. Sending trigger signals with positive and/or negative flanks, will activate the step to the next preset, when the DifAs is in sequence mode. GND. Both banana and pin-header can be used for the ground connection. When you are working with different devices, it’s important to make a good ground connection. X0-X15, Input. 16 x audio input on banana connector and small pin header. It is connected in parallel and connected in exact the same order as the banana connectors. From left to right X0-X7 upper row and X8-X15 on the lower row. The maximum amplitude the DifAs can switch is between -12V and +12V. 2. Y0-Y15, Output. These 16 banana-connectors are physical outputs of the DifAs. Also the small pin-header connections can be used for output. They are connected in parallel and connected in exact the same order as the banana connectors. From left to right Y0-Y7 upper row and Y8-Y15 on the lower row. 3. CV-preset input. If you apply this control voltage and you select this option (v85), the value will determine the next preset in line if the DifAs is in sequence mode. Model 1 does not have a physical switch to activate this mode and switch between internal potentiometer and external cv. 4. CV-sequence speed input. This cv input can be used to change the speed go the sequence linked to the value of the control voltage. If the value of the cv is high, the speed is at its maximum (around 1,7kHz). Low values result in slower speeds. 5. Manual On/Off. You can switch to manual-mode. The leds  will indicate which preset is active and with the switches  and  you can step Up or Down. 6. External trigger input. Sending trigger signals with positive and/or negative flanks, will activate the step to the next preset, when the DifAs is in sequence mode. 7. X0-X15, Input. 16 x audio input on banana connector and small pin header. It is connected in parallel and connected in exact the same order as the banana connectors. From left to right X0-X7 upper row and X8-X15 on the lower row. The maximum amplitude the DifAs can switch is between -12V and +12V. 8. Ethernet In/Out. Direct ethernet connection (cat5) to the computer or network. The communication is realized with OpenSoundControl. 9. Up. If manual mode is selected, pushing this button will step to the next preset. 10. Led indication. These 5 leds indicate which preset is active when the DifAs is in manual mode . The indication is binary, varying from 00000-11111 (=32 presets). 11. Down. If manual mode is selected, pushing this button will activate the previous preset. This is maxpatch version v85. The matrix. Clicking on the gray dots wil instantly send a /pa string to the DifAs, activating this connection. If a preset is created, this preset can be stored by shift-clicking on one of the locations in . Preset banks. In this box the presets created in the matrix  can be stored. The preset can also be written to file or read from file. To create a physical connection, click on the right junctions in the matrix. If the dots are lighting up in yellow, the connections are active and the preset can be stored. Storing a preset can be done by clicking on the right number preset box in  and hold down the shift key at the same time. When all presets are made and it is time to sequence through the different presets, select the right number (1-6) in box  and start the sequence with the start button in box . Udpsend. The computer has to send the OSC-messages to the right ip-address and port. On the left side in box the ip-address and port of the DifAs has to be filled in. The port number should be 10001. Udpreceive. On the right side the receiving port is defined. 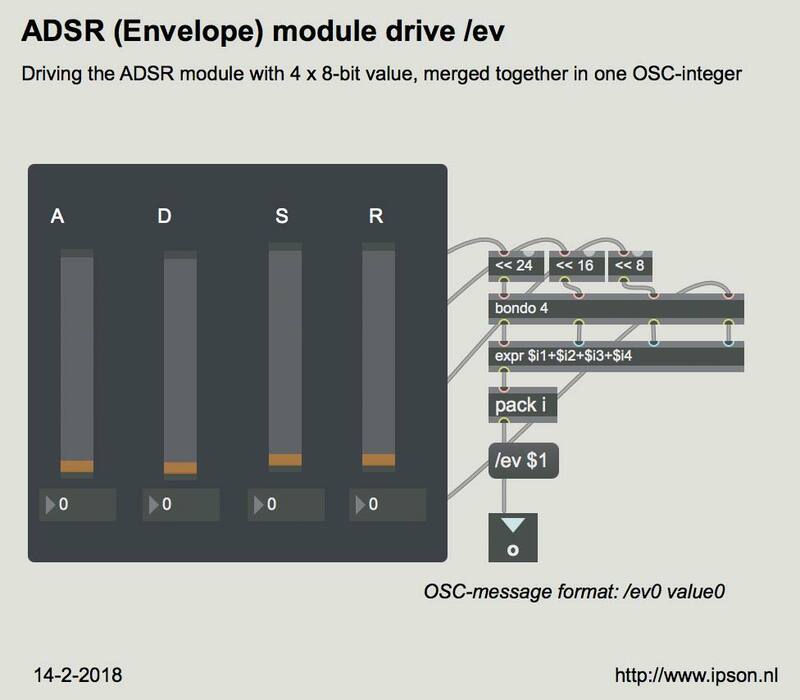 Port 8000 will be set to receive OSC-messages from the DifAs, unless it is configured differently in the embedded webserver (see getting started). Sequence from lists. When you created presets, but you want to sequence through the presets in a specific order other than up/down, you should create and use lists. If the button ‘Seq List’ is active (green, or blue) the OSC sequence start/stop  will sequence from the list . In this list presets-id’s are written from the selected bank at . Before the list can be sequenced, the list should be ‘pushed’ or activiated (red/black button). OSC visual feedback. This part of the patch shows the incoming OSC-messages from the DifAs in order to have (visual) feedback. Whether the DifAs will send OSC messages back to the computer depends on the settings of the switches or the settings of the controls explained at . When the ‘print Max’ switch is turned on, the patch will print the vales that are send to the DifAs in the max-window. This option is for controlling or testing purposes only – it will slow down the total performance of the Max patch considerably. Configure DifAs. This part of the patch controls the configuration. The switches in this box replacing the physical switches on the different models. The biggest button on top start/stops the local sequence. The following options can be chosen going down in the patch: Internal or external trigger; Only positive or both positive and negative flank reaction for external trigger; Internal normal sequence (up/down) or ext. cv-sequence; At normal sequence up or down; The source for the speed (timing) from OSC (the patch) or from ext. Cv-speed; The last one is switching On/Off the OSC-feedback. Uploading presets to the DifAs. This box sends the /st OSC-message in order to store the presets in local memory. When the big cross (upload to DifAs) is clicked, the active preset bank, selected at , will be uploaded. The rest of the variables shown in this box  generate a new /cf OSC-message changing the timer and the amount of presets (N) of the sequence. OSC-sequence. This part starts or stops the OSC-sequence. If it is active the patch sends /pa OSC-messages at variable speeds and it sequences through the selected preset-bank . The speed and the amount of presets of the sequence (N) can be set as well. To offer more variation a choice of Up/Down, Pendulum (up and down) or ‘Urn’ are offered. This last option ‘Urn’ sequences through a set of presets (bank) in random order, but will use all the presets at least one time before starting with the next round. The DifAs needs +15V (120mA), -15V(120mA), +5V(250mA) and GND. The power supply should be part of the system and I used the ‘Traco-Power TML 15515’ for the power-supply. The euro-rack version (DifAS model 6) can be connected to the power supply of the Doepfer A-100 system. 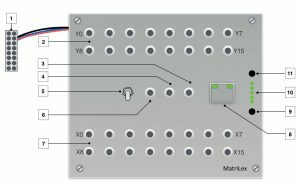 The matrix, the AD75019 from Analog Devices, can switch audio signals between -12V and +12V. Higher values will cause distortion. The opamps (NE5532 and TL072) are working on the same power-rail from -12V to +12V. 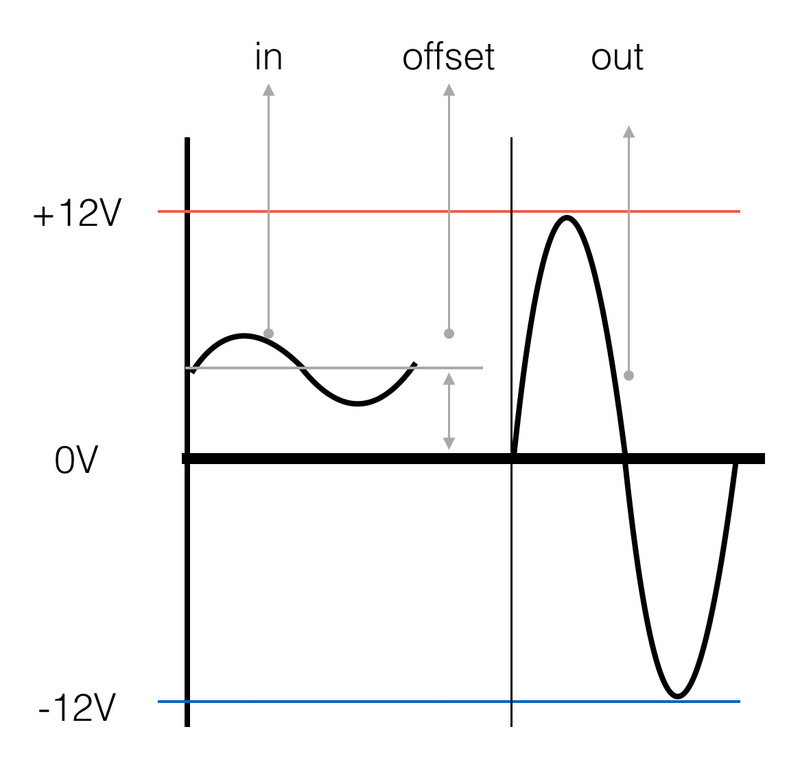 In the inside of the DifAs all digital signals are +5V or 0V. 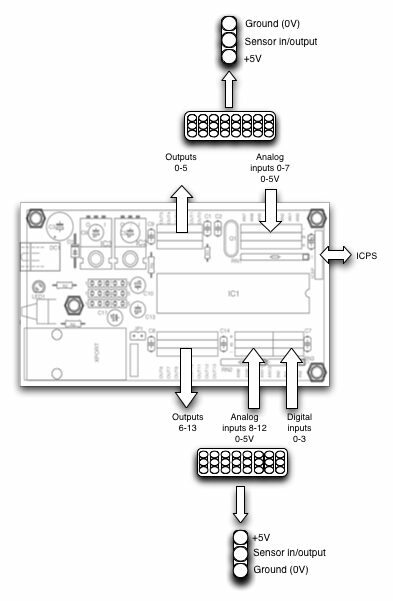 Also the PIC18F2523 microcontroller with its Analog to Digital convertor (ADC) can only handle 0-5V. 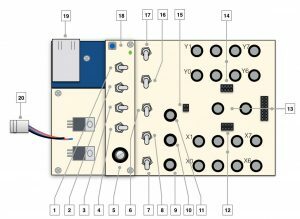 Since there are a lot of different standars regarding the control voltages and modulair synth’s, the DifAs models have some modifications on board to re-scale these values to the appropriate values. These inputs can take -5V to +5V on the CV input. This is the audio standard from Doepfer (A-100 set). The value will be re-scaled internally from 0 to 5V. This input can handle 0-12V. The value will be re-scaled from 0 to 5V. The Max/Msp patch can be downloaded from http://www.ipson.nl.